Annually since the early 1980's, the S.C. Department of Natural Resources (DNR) conducts a Summer Turkey Survey to estimate reproduction and recruitment of wild turkeys in South Carolina. The survey involves agency wildlife biologists, technicians and conservation officers, as well as many volunteers from other natural resource agencies and the general public. Although wild turkeys nest primarily in April and May in South Carolina, the survey does not take place until late summer, according to Charles Ruth, DNR Deer and Wild Turkey Program coordinator. 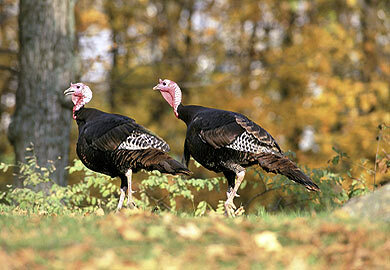 Therefore, the survey statistics document poults (young turkeys) that actually survived and entered the fall population. "Reproduction in turkeys has generally been low for the last decade", said Ruth. "This year, average brood size of 3.6 poults remained good, but the total recruitment ratio of 1.5 was low continuing a less than desirable trend. This low figure was driven by a high percentage of hens (59%) that had no poults at all by late summer. Recruitment ratio has averaged 1.7 over the last 5 years, keep in mind that 2.0 is somewhat of a break even mark. In fact, when turkey populations were expanding during the 1980's recruitment ratio averaged 3.5. Recruitment ratio is a measure of young entering the population based on the number of hens in the population. "At the regional level it appears that reproduction was poor in most of the state." Unlike deer, wild turkeys are much more susceptible to significant fluctuations in reproduction and recruitment. Lack of reproductive success is often associated with bad weather (cold and wet) during nesting and brood rearing season. However, there are a host of predators that take advantage of turkey nests and broods including; raccoons, opossums, snakes, foxes, bobcats, and numerous avian predators. Coyotes which are not native but are now well established in the state can be added to the list of turkey predators. Turkeys naturally have high reproductive potential and are therefore able to maintain populations in spite of predation and other mortality factors. The problem is that we have not been getting much "bounce back" amid years of poor recruitment. What does poor reproduction last summer mean for the spring turkey hunter? Ruth indicated, "Spring harvest trends have followed trends in reproduction for many years. For example, the harvest in 2015 was down significantly which was not a surprise because reproduction in 2013 was the lowest on record. Two-year-old gobblers comprise most of the harvest because they are typically more abundant and more responsive to hunters' calls than older more dominant gobblers and there simply were not good numbers of two year old birds last season. On the other hand, the percentage of jakes (juvenile males) harvested in 2015 was substantially higher which is typical when 2 year old birds are not abundant. Finally, the gobbler to hen ratio during last summer's survey was 0.5 which is the lowest since the year 2000," said Ruth. "Low gobbler to hen ratios can affect the quality of hunting because hens are extremely available which affects gobbling and responsiveness to calling by hunters." "The bottom line," Ruth said, "is the state's turkey population is about 35 percent below record levels of around the turn of the century. We need better reproduction for several years to get the population back up. That is the nice thing about turkeys though; given the right conditions they can naturally bounce back in a short period of time."